With all the negative press vaping is getting, and the constant claims that there is “no evidence” concerning the overall safety of ecigs and vapor, we decided to muck in and do the research for you. Why? Simple: there is a MYRIAD of positive studies concerning vaping. And most of them aren’t new; some have been around for ages. You just don’t know about them because the MSM is powered by action/interest/lobby groups. Straight-up science is boring; it doesn’t make people scared or concerned or think the world is going to end. Not unless it is scary science, then it’s all gravy. Negative headlines get more clicks; this is a fact – and a key trend in increasing a website’s click-through-rate (CTR). This is why the world’s biggest news sites are full of doom and gloom: clicks – the more you click, the more money they make from ads. Most of the time, you’re not getting the full picture. Especially in the US when vaping is concerned. This is why we published this piece. Yes, we’re a site about vaping. But we’re also advocates of truth and science, as well as playing an active role in the fight against smoking. Pour yourself a cold one and strap in, as we detail 10 pro-vaping studies that the FDA really doesn’t want you to know about. This one has been around for a while now, and it is the backbone of the UK’s pro-vaping stance. Multiple studies conducted by the Royal College of Physicians and Public Health England concluded multiple times that vaping is indeed 95% safer than smoking. The gain of these findings has compelled the UK government to support vaping as a positive thing that can (and does) help smokers kick their cigarette habit. The idea that people would start vaping, having never smoked, and then, one day, decide to pick up a 20 pack of Camels is ludicrous. And yet this is one of the more constant claims made by the FDA. But, as you’ll see in the report, the data tells a different story: vaping is not a gateway to smoking. Smoking kills. And the reason for this is simple: tobacco smoke is chock-full of carcinogens. 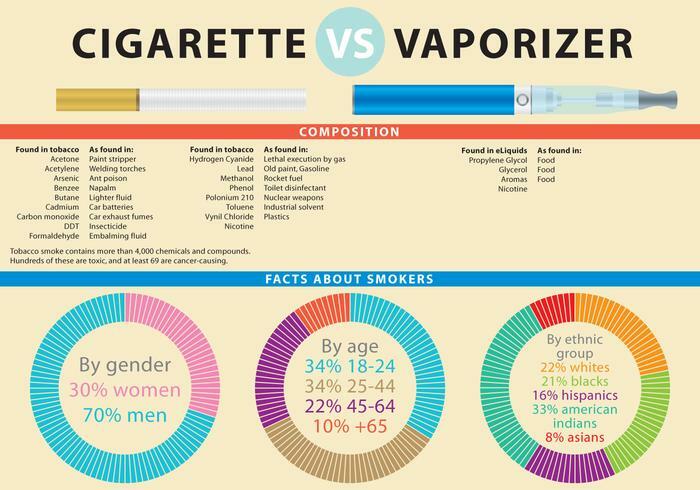 Vapor, on the other hand, does not contain any carcinogens, as evidenced in the study cited above. The biggest claim leveled against vaping right now is that it actively targets kids with sweet, tasty E Juice flavors. Again, this claim is complete bunk: aren’t adults allowed to enjoy tasty things? Vaping is prohibited BY LAW for minors, just like alcohol is, and you don’t see booze companies taking it in the rear from interest groups over their sweet-flavored drinks now, do you? Nice-tasting E Juice is a key component to staying off cigarettes. For many, it is the ONLY thing. This point is expressed perfectly in the cited study and proves the central role flavored E Juice plays in keeping smoking rates down. This is an old one (2015), but it is definitely worthy of mention. Back in the day, circa 2015, a study came out claiming that all ecigs kicked out noxious amounts of Formaldehyde. People were scared and worried, as you’d imagine. Then someone did some actual, real-world research into testing these claims. The result? It was complete BUNK! The claims were not correct as the devices used were used in a manner completely unnatural (ran at ridiculously high-outputs to create a burn-effect). And this is NOT how people actually vape. This one is a BIG ONE. The FDA, and its pals in Big Pharma, don’t want you using vaping devices because they’d rather you use things like nicotine gum. Why? Money! Big Pharma has invested billions in this smoking cessation technology and now it’s getting its pals to kill the competition. But here’s where it gets interesting: the study cited above shows that people who use nicotine gum are more dependent on nicotine than those that use vaping devices. Yep, you read that right: nicotine gum is MORE addictive than vaping. Long-term smokers with lung issues were used in a study to highlight the effects of switching to vaping products. The results were impressive: all showed improved lung function versus previous data from when they were smoking. This tells us two things: 1) vaping is healthier and safer than smoking, and 2) vaping can help reverse the damage of smoking without the individual going through nicotine withdrawal. And these two combined will ensure a higher success rate in keeping those heavily addicted to tobacco off tobacco for good. If you read the papers or watch the news, you could be forgiven for thinking that the vapor produced by ecigs is more toxic than the fallout from Fukushima. This is the official line of the anti-vaping crew – that, or “we simply don’t know just how bad the effects are”. Well, science once again is here to set the record straight: second-hand vapor is NOT harmful to people, animals, trees, or fairies. Nicotine is addictive. We all know this. But the key thing everybody fails to mention is that the key to HOW addictive it is is down to how it’s delivered. Cigarettes are more addictive than ecigs. Ditto nicotine gum, as mentioned earlier. Take away the carcinogens associated with smoking, and long-term exposure to nicotine does not lead to any long-term health effects. What are the chances of getting cancer from vaping? Pretty slim, according to Tobacco Control. Why? Simple: vapor does not contain anyway near the level of carcinogens as tobacco smoke – less than 1%, officially. Less than 1%! Meaning you’re more likely to be struck by lightning.